At the heart of UPLINX Track & Audit is the Configuration Backup Repository. This fully automated system allows you to simplify configuration management of all Cisco Unified servers. You no longer need to actively backup or review configurations of Cisco CUCM, CUC and IMP. UPLINX Track & Audit does it all for you. Using its own Configuration Backup Repository, Track & Audit can automatically generate configuration reports, can track changes, and can act on that information to alert system administrators. When critical changes occur, the system sends out email alerts containing a list of changes which can be reviewed within seconds from the convenience of your email client. Daily configuration reports enable you to quickly undo configuration changes that are causing issues. Configuration reports for Cisco Unified Communications or audit reports can be accessed by web browser. Change alerts can be reviewed within seconds from the convenience of your email client. 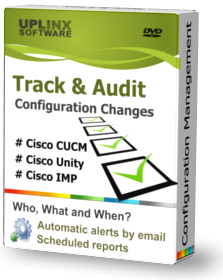 Daily configuration reports enable you to quickly see past and current configuration settings and any changes applied to undo any configuration changes on the Cisco Web Admin. Identify quickly any changes that have been applied by whom and when with the previous and new value settings. Ad-hoc comparison reports between any two configuration reports contain all the changes between the two dates when the configuration reports have been generated. 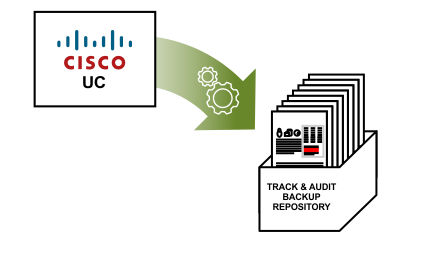 Automatically generates daily configuration backups for all Cisco Unified Communications servers and stores them. Triggers email notifications to administrators for successful or failed backup operations. Browse though configuration backups from your web browser and provide secure access to dedicated users with authentication to Active Directory. Identify configuration changes in the configuration backups and revert to previous configurations. Sends you email alerts containing configurations changes which can be reviewed within seconds - including the change, time and user details - for immediate attention.